1). Sheila Bair rings Jamie Dimon and suggests to him that she might confiscate the assets of Washington Mutual. She says that Jamie should prepare a bid. 2). One week later the Office of Thrift Supervision signs a memorandum of understanding with WaMu saying that WaMu does not need to raise capital or increase liquidity. 3). Sheila Bair forces WaMu to get investment bankers in who will do due diligence. 4). The investment bankers talk down WaMu for weeks in press and cause a minor run. 5). The OTS seizes WaMu without any real indication to the management that this was going to happen and sells it to her hand-picked banker (Jamie Dimon). The deal is irrevocable. In the process she puts the fear-of-government in all the intermediate holders of US Bank finance. This exacerbates the crisis. 6). The WaMu deal causes a panic at Wachovia. There was no panic at Wachovia prior to this – though Wachovia stock is justifiably weak. 7). On Sheila’s timetable a deal has to be done for Wachovia in three days. 8). Sheila decides that no deal can be done without government support and she offers that support. Wells Fargo has simply told her they need more time. Having done due diligence on a small bank I can assure you three days is not enough for a large bank unless the Government is going to give you large warranties. Sheila created a timetable that forced the government into a deal that was potentially bad for taxpayers. 9). A few more days and the deal turns up that doesn’t cost taxpayers anything. Sheila however has staked her reputation on the prior deal and defends her prior behaviour. I have argued that Sheila should be sacked. I think that is pretty obvious now. Your comments are exactly correct. Wamu was solvent, as was Wachovia. You do a excellent job of placing the dots of Blair's actions. The bailout bill is also a major dot. However I feel you must connect them. First off, Blair is a team player. The Paulson's team's plan is to create 5 super banks to control every facet of American financial life. There is a reason why Wamu was given to Chase. There is a reason why Blair was forcing Wachovia into Citicorp. 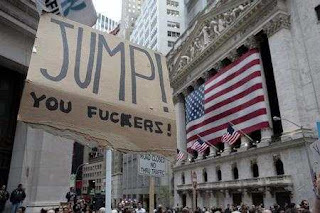 The 5 super banks will be GS, MS, CMB, BAC and C. All of the bailout money will funnel into these banks. Some crumbs may fall off the table for the others but this is the plan. If you look at all the actions with this in mind it becomes very clear. Next up GS will buy from the FDIC (for pennies) IndyMac. The Treasury is putting all their chips into these 5 banks. I also completely agree. When has the US gov't taken over a capitalized bank? Ever? I ask this question honestly. Have they ever taken over a bank that according to the OTS was capitalized? How is the media not jumping on this story? I had a few share (very few) but it scares me out of my mind that the government took over a bank that hadn't failed. My faith in our econommic system is lost. anon 3:13 AM: Bair not BLair. The latter already resigned. Thanks John, you lay it all out well. Isn't it funny how the primary government agency responsible for "preventing" bank runs is actually so inept it has ended up making things worse, and defeated even that rather limited purpose? Note: I don't say they are in charge of making the institutions sound, which arguably, very few of them are (and the FDIC seems to know it). In their own cronyist way, all the FDIC has done is reveal how brittle the entire system is. John, I think your buddy SB is very liable in an appropriate suit. If you'd like to discuss it let me know. HMMM, now that time has passed, have any of your genius minds decided to come to your senses? The Paulson plan was a joke, we are investing capital without accountability to the taxpayer, no transparency as to current valuation of the preferred stock, no foreclosure assistance from Paulson, and how can you say WaMu and Wacovia were sound?? What about subprime, what about Wacovia's eariler acquisition of the thrift who loaded up with option ARMs (pay if you feel like it!). Now who is the genius? I wonder what all of you will say when Sheila Bair turns out to be the most successful Treasury Secretary in the history of this country, that is if Obama chooses her. Have fun with our criticism of a smart, fiscally responsible patriot! LMFAO thank you for that laugh, I really needed it. Yes, Shiela Bair would make a WONDERFUL Treasury secretary - or better yet, why don't we just elect her Princess of the United States and hand over what little actual wealth remains in this country? YOU are the true genius!!! bwhahahaha. p.s. you're really a moron. I'm not sure if you can understand "sarcasm" in that delusional state of mind you were obviously in when you wrote that last year.